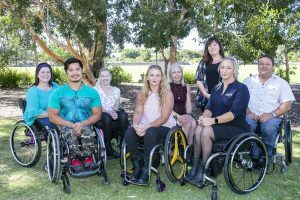 Spinal Life Australia’s newest WA Peer Support Team members (from left) Tayla Stone, Nang van Nguyen, Chelsey Phillips, Karen Harvey, Jane Hutch, Amanda Wilson and Douglas Milne, with Queensland-based trainer Katie Hammond (front, second from right). Karen Harvey is looking forward to helping others through their spinal cord damage journey, as one of seven members of the newest Spinal Life Australia Peer Support team in Western Australia. The Peer Support team will provide advice, mentorship and guidance to members of the WA community who have sustained spinal cord damage, drawing upon their own lived experiences. “There are times when only someone who has been through a spinal cord injury themselves can truly understand what you are going through,” Karen said. Executive Manager – Member Services Ross Duncan said studies and experience have demonstrated the value of an effective peer support program for people with spinal cord damage. “It enhances their connections with the community and improves their skills to self-manage their condition, as well as creating greater resilience and self-awareness,” Ross said. “This is why we feel it’s important to provide the WA community with a dedicated local team of people they can trust who can relate and offer guidance for the challenges and issues they’re going through. “We’re also looking forward to working in conjunction with the in-hospital peer support program. The Peer Support program comes after the launch of Member Services in WA in mid-2018 and, more recently, the launch of Personal Support and Home Care Services to provide Perth residents with specialised in-home personal support. To find out more information about the Peer Support program in WA, contact Debbie Nobre on dnobre@spinal.com.au.